For the northern Californian wine region, see Carmel Valley AVA. Carmel Valley is bordered to the north by the North City Future Urbanizing Area (NCFUA) and Pacific Highlands Ranch; to the south by Los Peñasquitos Canyon Preserve and Torrey Hills; to the east by Pacific Highlands Ranch and Del Mar Mesa; and to the west by Interstate 5 and Torrey Pines. Nearby is the Torrey Pines State Natural Reserve, where one of two stands of the endangered Torrey Pine is found to occur. The area overlooks the ocean and is located in the hills. According to the San Diego County Assessor's Office's 2006 estimates, there were 42,047 people residing in the neighborhood, a 49.2% increase from 2000. The racial makeup of the neighborhood was 70.6% White, 18.0% Asian & Pacific Islander, 7.0% Hispanic, 3.4% from other races, 0.89% African American, and 0.001% American Indian. The neighborhood is diverse in age with 30.2% under 18 and 6.5% over 65. The median age was 36.6. There were 2.7 persons per household. The annual median household income was $120,886. According to the United States Census Bureau, as accessed from the American FactFinder website, the total population of the 92130 area code in the 2010 census was 48,940 with a 5-year estimate of 51,757 in 2016. There are very low crime rates and a very small homeless population within the community. Companies with offices in this neighborhood include US Bank, Scripps Health, Sony, Opera Solutions, Pillsbury Winthrop Shaw Pittman, Fish & Richardson, Morrison & Foerster, Sheppard, Mullin, Richter & Hampton and The Allen Group. The headquarters of Neurocrine Biosciences and ICW Group Insurance Companies are located in this neighborhood. Mixed-use development One Paseo had its soft opening in March 2019. ^ a b "Population and Housing Estimates, City of San Diego" (PDF). SANDAG (San Diego Association of Governments). Retrieved 2007-03-12. ^ "San Diego Communities". City of San Diego. Retrieved 22 December 2014. Carmel Valley is a newer, master-planned community that has matured into a place where people can live, work and play. ^ "North City West Community Plan" (PDF). City of San Diego. Retrieved 22 December 2014. The following North City West Community Plan was adopted by the Council on February 27, 1975 by Resolution 0212692. The Plan presents a proposal for the development of the North City West Study Area as a new community of approximately 40,000 persons. ^ "What Type of Lifestyle Does Carmel Valley, San Diego Offer?". Willis Allen. Retrieved 22 December 2014. The master-planned community, which sits at the foot Carmel Mountain, was constructed beginning in 1983. 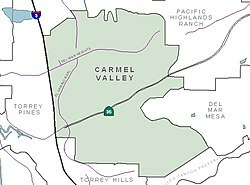 ^ a b "San Diego Community Profile: Carmel Valley". City of San Diego web site. Retrieved 2007-03-12. ^ "Earl Warren Middle School - Solana Beach, California - CA | GreatSchools". www.greatschools.org. Retrieved 2017-02-09. 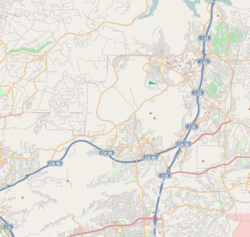 Wikimedia Commons has media related to Carmel Valley, San Diego. Karen Billing. Thriving Carmel Valley turns 30 this year: Residents remember the beginning. Del Mar Times, 1/7/2013. This page was last edited on 17 March 2019, at 08:20 (UTC).